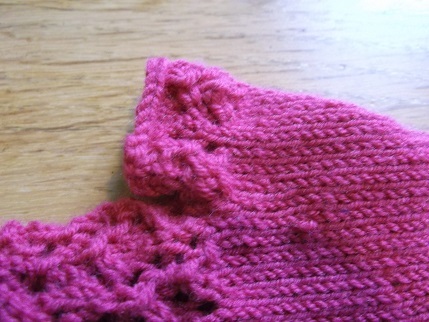 I have been wanting to learn to knit with double-pointed and circular needles for ages, I did try a pair of socks of few years ago and it was a disaster as I could not avoid making holes at the join of the stitches. The recent delivery of the Knit for Winter pattern meant that I knew I had to try to tackle it again and I am very pleased to say that with the help of my lovely friends at knitting group, (especially Sarah who was so patient when I kept ending up with only two needles), I have managed it. This is truly knitting genius and I have to say I am hooked, don’t think I will ever knit in the flat again, all the things they say about knitting in the round are true. 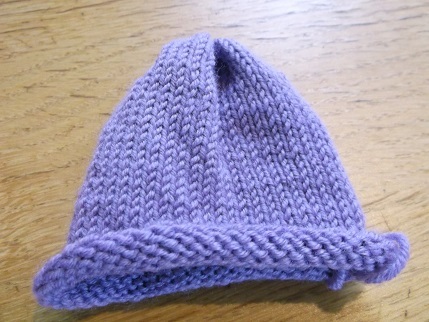 It is so clever to just knit and get stocking stitch without having to remember which is your purl row. And no seams! That is fantastic. 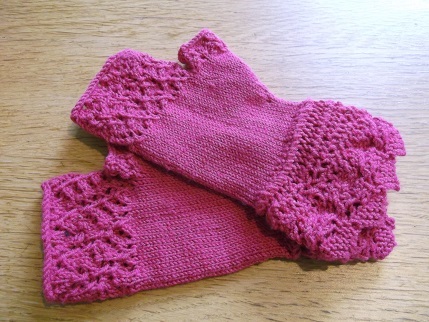 I have finished one pair of the mittens from the Erin Cowl and Fingerless Mitts pattern by Lesley Jones and I am pleased with most of the work. I did have little issues with losing stitches from the end of my needles so have had to pick up a few things which makes it look a bit messy. 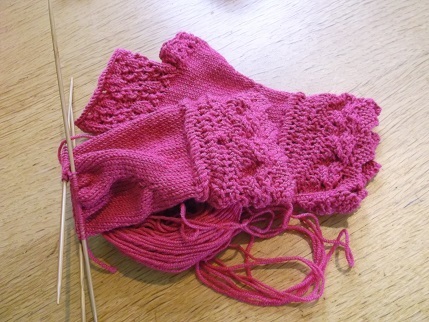 The lace pattern at the top did also go a bit awry – I like the look of the pattern that I ended up with but the two mitts don’t match very well so I have been knitting another pair which are coming out better for the Knit for Winter project and will keep the first pair for myself. I am also very proud of the fact that I have knitted a thumb for the first time especially as knitting a lace pattern on only 24 stitches in the round was very fiddly! I have plans to knit the cowl as well to match. I have lots of this wool left and it is so pretty. 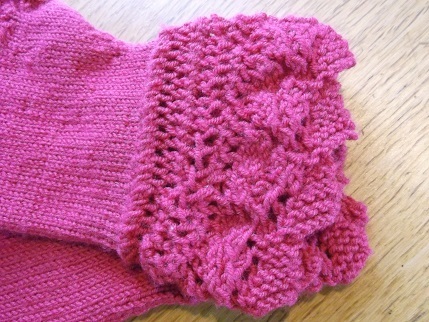 Despite the mitts pattern looking a bit complex it isn’t and I have really enjoyed it, it completes quickly and is simple enough to work the lace while watching TV. I am also very excited as now that I have learnt to work in the round I am going to able to knit a sample for Sarah, she designs her own patterns, (a true knitting genius), under the name Aldersign Designs and has a stall booked at Yarndale in September this year so I am going to knit a pair of mitts for the stall. She is working on a book of patterns all inspired by Elves which will be fantastic. I am also going to be working on some knitting accessories such as pin cushions, scissor and needles storage etc for her to sell on her stall as well using mainly my recycled denim, vintage crochet and embroidery and hexi applique. Below is a little bit of knitting in the round that I have done with some spare stash Debbie Bliss Sublime yarn that I will being turning into a pincushion. I love how working on such small needles (2.5mm) gives you such a neat and pretty pattern in simple stocking stitch. This will be my summer project in between kit making. 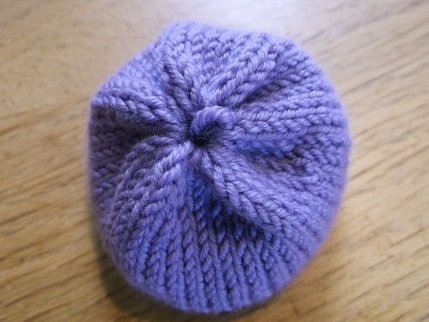 The great thing is that knitting in the round is so portable for taking on trains and knitting in cars on the journeys to events. So that is my summer crafting sorted! Am spending most of this weekend finally getting to make the surcoat for Jamie and may be able to make the April Block of the Month as well – have got behind due to the loveliness of having holidays and lots of visitors last month but must get some of the kit I have promised everyone (including me!) actually started. Hope that you are all going to have a lovely weekend ahead. Thanks for visiting. Congratulations on achieving knitting in the round!